The Sami people (also Sámi, Saami, Lapps and Laplanders) are the indigenous people of Sápmi, or Lapland, which encompasses parts of northern Sweden, Norway, Finland and the Kola Peninsula of Russia. The Sami are one of the largest indigenous groups in Europe, and their ancestral lands span an area the size of Sweden in the Nordic countries. Traditional Sami occupations are hunting, fishing, farming, and reindeer herding, though only a minority of today's Sami make a living from these activities alone, and virtually none live in a natural economy nor have a nomadic lifestyle. The population is estimated to be between 50,000 to 100,000, although it is difficult to establish an accurate number. Roughly half of all Sami live in Norway, a significant number live in Sweden and Finland, and a smaller number live in the north of Russia. After oppression and efforts to assimilate the Sami into the mainstream during the nineteenth and early twentieth centuries, the late twentieth century saw a change in attitude with the creation of a national flag and national anthem. Efforts now focus on the maintenance of Sami culture, including the use of Sami language in schools, and the establishment of Sami media as well as cultural and political societies. This has not only revived interest in their traditional culture within Sami people, but has brought Sami music in particular to the attention of the wider society. Although much of their traditional lifestyle and wisdom has been lost, their unique creativity may yet be able to contribute to human society as a whole. 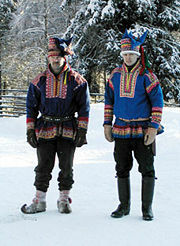 Two men in traditional Sami costumes outside of Rovaniemi, Finland. The Sami were previously known in other languages as Lap(p). This name was originally used in Sweden and Finland, and from there the word was exported to all major European languages (German: Lappen, French: lapons, Spanish: lapones). The Sami have always referred to themselves as Sámid ("the Samis") or Sápmelaš ("of Sami kin"). One of the main meanings of the term "Lapp" is "a patch of cloth for mending" and suggests that the Sami wear patched clothes out of poverty, making "Lapp" a derogatory and offensive term. This is particularly problematic since the Sami have historically had to deal with stereotyped ideas of being vagabonds and drunks. Sami institutions, notably the parliaments, the radio and television stations, and theaters, all use the term Sami, as do academic references. The Sami peoples have inhabited the northern regions of Scandinavia for thousands of years. Archaelogical evidence suggests that people along the southern shores of Lake Ääninen and around Lake Ladoga in Russia reached the River Utsjoki, located by the modern border between Russia and Norway, as early as 8100 B.C.E. After the Ice Age, West European people also came into Scandinavia. This two-part migration matches up with ancient Sami myths, which tell of long migrations from the north and the south. Historically, the Sami inhabited a larger area of Scandinavia and Karelia, but Finnish and Scandinavian settlers drove them progressively more north. There have been theories about the supposed Asian origin of the Sami. In the early nineteenth century, the now-discredited theory of Ural-Altaic languages was believed even by the Finns, who arranged many ethnographic expeditions to Mongolia to find this theoretical link between the Asian and Finnic peoples. Stereotyped physical features, phrenology and other pseudosciences were used to "prove" the supposed Asian origin of the Sami. However, no common vocabulary was established, nor did genetic studies show any significant links. DNA studies showed that the Asian genetic influence is no higher than the European average. Three specific markers are found in one third of the Sami: markers that have only been found elsewhere in one Finnish and five Karelian samples. This implies that there was a long period of time during which the Sami were likely isolated from the rest of the world's population; possibly during the last Ice Age. Lapponia (1673), written by the rhetorician Johannes Schefferus, is the oldest source of detailed information on Sami culture. It was written to combat foreign propaganda (in particular from Germany) claiming Sweden had won victories on the battlefield by means of "Sami magic." Ironically enough, in later abridged adaptations, chapters on the Sami's difficult living conditions, topography, and the environment were replaced by made-up stories of magic, sorcery, drums, and heathenry. The Sami crossed the borders freely until 1826, when the Norwegian/Finnish/Russian border was closed. Sami were still free to cross the border between Sweden and Norway according to inherited rights laid down in the Lapp Codicil of 1751 until 1940, when the border was closed due to Germany's occupation of Norway. After World War II, they were not allowed to return. Their summer pasturages are today used by Sami originating in Kautokeino. Map of the Sami people. 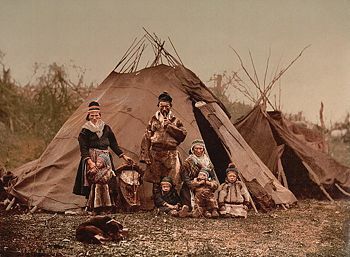 For long periods of time, the Sami lifestyle reigned supreme in the north because of its unique adaptation to the Arctic environment, enabling Sami culture to resist cultural influences from the South. Indeed, throughout the eighteenth century, as Norwegians of Northern Norway suffered from low fish prices and consequent depopulation, the Sami cultural element was strengthened, since the Sami were independent of supplies from southern Norway. However, in the nineteenth century Norwegian authorities suppressed the Sami culture in order to make the Norwegian language and culture universal. A strong economic development of the north also took place, giving Norwegian culture and language priority status. On the Swedish and Finnish side, the authorities were much less militant in their efforts, but economic development of the north led to a weakening of status and economy for the Sami. The strongest pressure took place from around 1900 to 1940, when Norway invested considerable money and effort to wipe out Sami culture. Notably, anyone who wanted to buy or lease state lands for agriculture had to prove knowledge of the Norwegian language. This ultimately caused the dislocation of Sami people in the 1920s, enlarging the gap between local Sami groups. During World War II, the Sami suffered heavy war destructions in Northern Finland and Northern Norway which destroyed all existing houses and visible traces of Sami culture. The Sami in Russia were forced by the Soviet authorities into one collective called Lovozero (Lujávri), in the central part of the Kola Peninsula. After World War II the pressure to assimilate was relaxed somewhat. The construction of the hydro-electric power station in Alta, Norway in 1979 brought Sami rights onto the political agenda, as it threatened to turn a large chunk of Sami land into a reservoir. Since the establishment of Sami Parliaments in Sweden (1993), Norway (1989), and Finland (1973), the Sami have been able to democratically elect representatives to help regulate issues in language, culture, education, and industry, as well as make sure Sami rights are not violated. The term "Sami religion" usually refers to the traditional, shamanistic religion. Information concerning the original religious views of the Sami is uncertain at best, and open to interpretation, since it was practiced until approximately the eighteenth century, when a major effort to convert the Sami to Christianity was made by Lutheran missionaries. Much of the earliest information that exists on the traditional Sami religion was interpreted through Christian missionaries during the seventeenth and eighteenth centuries, by which point the Sami religion had been influenced by Scandinavian culture and Christianity. Additionally, much of the information gathered was in languages other than Sami, and may have suffered distortion through translation. According to what is known, traditional Sami religious beliefs place a great deal of importance on the shaman, or noaidis. 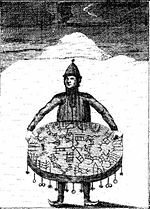 The noaidis was believed to be able to prophesy and predict future success and welfare with the use of a drum decorated with paintings, and served as the link between the people and the gods. The noaidis was believed to be able to go into a trance, through the aid of his drum, and contact the spiritual world. Noaiddit (shamans) along the coast were sometimes consulted by the Vikings as well, and stories of their abilities and use of sorcery were common. The noaiddit also kept and passed on myths and rites, and healed illnesses with herbal cures. Christianity was spread by Catholic missionaries as early as the thirteenth century, but did not become a powerful influence until the eighteenth century. Increased pressure to convert the Sami came after the Lutheran reformation. The Sami initially adapted to the Christian influence by painting Christian imagery on the shaman drums below the traditional gods, attending church on Sunday, and practicing their traditional religion at home. The Church then began a stronger effort to eradicate shamanism: rune drums were taken from the Sami, then burned or sent to museums abroad, and visible elements of the pre-Christian religion were criminalized. The Swedish Sami vicar, Lars Levi Læstadius initiated a puritan, Lutheran movement among the Sami around 1840, which remains a dominant religion in Sami speaking areas. The Sami language is divided into nine dialects, of which several have their own written languages (orthography). The languages are different enough that Southern Sami cannot understand the language spoken by Northern Sami. Most dialects are spoken in several countries, because linguistic borders do not correspond to national borders. The Sami language group is part of the Finno-Ugric family, related to Finnish, Estonian, and (distantly) Hungarian but not to Norwegian. Due to prolonged contact with the Scandinavians, however, there are a large number of Germanic words in Sami. The majority of present day Sami speak the majority languages of the countries they live in, namely Swedish, Russian, Finnish, and Norwegian. Historically, the Sami were strongly pushed towards assimilation, which resulted in a severe decline in the use of the Sami languages. Many Sami no longer understand their mother tongue, but efforts are being made to further the use of Sami language among the Sami, such as teaching classes to Sami students in Sami, as well as offering classes with Sami as a subject. An important aspect of Sami culture is the joik (pronounced "yoik"), a traditional Sami chant that was traditionally a part of Sami spiritualism. Joiks are traditionally sung, or joiked, a capella without the use of instruments, and are vastly different from the traditional western idea of a "song." The joiker is considered an integral part of the joik, and there is no concept of a joik being "about" something; rather, the song and subject are one. Unlike western songs, a joik is more circular and fluid in nature, with no beginning or end and no set melody. There are joiks for people, animals, and land; in Sami tradition it was equally important to have a joik as it was to be given a name. Other Sami music modes are the lavlu/laavloe and vuelie. The laavloe incorporates lyrics, while the vuelie is a storytelling song about a person or event. Flutes and bullroarers (a carved piece of horn or wood swung overhead on a string) have traditionally been a part of Sami music, and modern-day Sami have reintroduced the traditional drum as accompaniment. The Sami singer Mari Boine is the most well known Sami artist, blending joik with jazz and rock. The Sami culture, suppressed and pressured to assimilate for so long, is now recognized and supported by the governments of Norway, Sweden, and Finland. Grants in all three countries help to promote Sami culture, including art, music, theater, education, and literature. Sami National Day, February 6, was first recognized in 1993. In August of 1986, the national anthem (Sámi soga lávlla) and flag of the Sami people were created. Large resources have been allocated to initiatives to promote Sami languages, both in an educational context as well as a social and official one. A long history of the suppression of the Sami languages and a historical ban on education in Sami has resulted in many Sami who no longer speak their mother tongue. Sami educational institutions have been founded in all three countries, and Sami language courses are starting to bring the language back to those who have lost it. Sami colleges, like the Sámi Instituhtta (Nordic Sami Institute) in Kautokeino, further the study of the Sami language and culture. Despite the increased availability of Sami schools and educational materials, less than ten percent of Sami children attend Sami school programs. Many Sami parents feel that attending a Sami school may put their child at a disadvantage, and hinder their ability to function in a technological and global society. Daily radio shows and television programming in the Sami language, including daily news bulletins, air in all three countries, including programs for children. Several newspapers and magazines are also published in the Sami language. There are novels and poetry collections published each year by Sami publishers, as well as Sami theater companies and Sami visual artists. Sami cultural expression underwent an explosion during the 1970s and 1980s, when Sami art, literature, and music were first brought into the global arena, but there is concern that these forms of Sami cultural expression are stagnating; no new ground is being explored, no innovative ideas are being brought forward. Sami theater troupes are performing less work written by Sami, and Sami literature and art tend to recycle the same ideas. It has been suggested that this stagnation is the result of a lack of internal critique within the Sami people. Artistic expression needs criticism in order to develop, and there is almost no public debate about Sami culture and art within the Sami. Sami music is perhaps the cultural expression most well known by the non-Sami world. Blending traditional instruments with modern ones, and incorporating the use of joik, Sami musicians have become popular with both Sami and non-Sami. Several musical festivals are held throughout the Sami area, combining traditional culture with more modern activities such as snowmobile racing. ↑ Kirsikka Moring Uncovering the secrets of the Sámi, a February 2006 Helsingin Sanomat article (in English).Retrieved February 4, 2008. ↑ Ande Somby Joik and the Theory of Knowledge accessdate October 31, 2006 University of Tromso. ↑ Sami Learning and Education accessdate November 6, 2006. The University of Texas. This page was last modified on 13 August 2015, at 16:26.